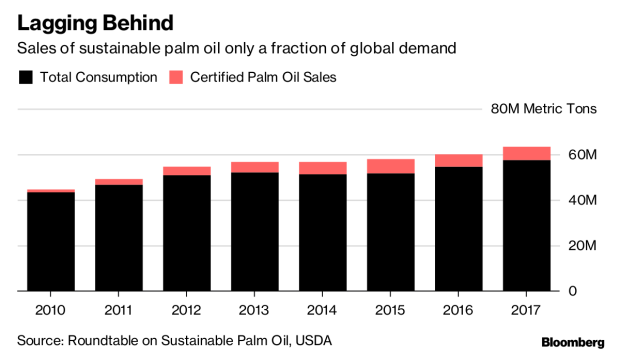 (Bloomberg) -- The world’s biggest growers of palm oil say they’re stepping up efforts to produce the contentious commodity more sustainably, but consumers are unwilling to pay more for environmentally friendly supply. The certified oil typically sells at a premium of about $30 a ton to the non-certified kind, though this can vary significantly depending on purchase volumes and negotiations between buyers and sellers. To gain certification, it costs producers a minimum of $8 to $12 a ton, and there are other additional expenses like audit fees, logistics and environmental assessments, says Sime Darby, the biggest producer of certified, sustainable palm oil (CSPO). The controversy surrounding palm has been simmering for decades, but the furor has recently intensified, with a U.K. supermarket chain’s viral anti-palm ad and environmental groups naming and shaming buyers of the unsustainable oil. The biggest blow to the industry may come from one of the top purchasers -- the European Union -- which is clamping down on unsustainable supply.